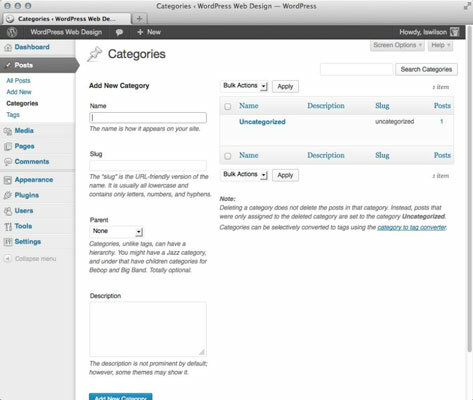 Upon installation, WordPress gives you one default category — Uncategorized. That category name is pretty generic, so you definitely want to change it to one that’s more specific and memorable to you. The default category also serves as kind of a fail-safe. If you publish a post to your blog and don’t assign that post to a category, WordPress automatically assigns that post to the default category, no matter what you name the category. 2Click the title of the category you want to edit. For example, if you want to change the Uncategorized category, click the Uncategorized link. The Edit Category page appears. 3Type the new name for the category in the Name text box and then type the new slug in the Slug text box. WordPress automatically inserts a dash between the slug words in the web address. 4Choose a parent category from the Parent drop-down list. 5Type a description of the category in the Description text box. Use this description to remind yourself what your category is about. 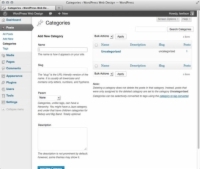 Some WordPress themes display the category description on your site, which can be helpful for your visitors. 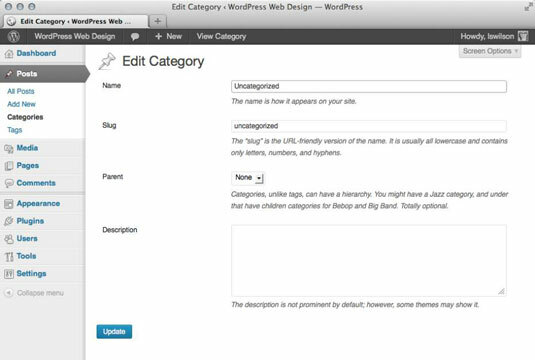 You’ll know whether your theme is coded in this way if your site displays the category description on the category page(s).